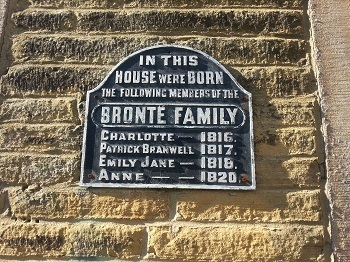 Situated on Market Street in the village of Thornton on the outskirts of Bradford in the heart of West Yorkshire's Bronte Country is the Bronte Birthplace, where the Bronte Sisters (along with their brother Branwell) were born and lived before moving to Haworth. Patrick and Maria Bronte moved in to the property in 1815 with their infant child Elizabeth (who was born earlier the same year at their previous home in Hartshead), with Charlotte, Branwell, Emily and Anne being born in 1816, 1817, 1818 and 1820 respectively. During this time Patrick was curate at the Old Bell Chapel in Thornton. In 1820 the family moved to the parsonage in Haworth - which is where of course Charlotte, Emily and Anne grew up with their brother Branwell, and where they gained much of the inspiration for their classic novels. Since then the Bronte Birthplace has undergone several changes of use, including periods as a butcher's shop and a restaurant. 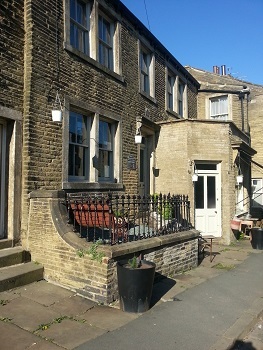 In the late 1990s the property was purchased and lovingly restored by the crime novelist Barbara Whitehead, who (with the support of the Bronte Birthplace Trust) opened the property as a museum before having to sell up in 2007. The property has recently been sold again and is currently (at the time of this update in 2018) a continental style bistro and coffee house.